Run-down façades, punks and ordinary workers: An exhibition in Berlin shows the works of Harald Hauswald, who simply wanted to document everyday life — without knowing that the Berlin Wall would one day come down. Before the premiere of his latest exhibition, Harald Hauswald signs autographs in his celebrated photobook, "Berlin-Ost: Die andere Seite einer Stadt" (Berlin East: The Other Side of a City) from 1987 that visitors have brought with them. Others hold up his new brochure, "Totally East: Life in East Germany," for signing. Stefan Wolle, historian and director of the GDR Museum in Berlin, has divided some 100 photos by the co-founder of the Ostkreuz photography agency into 18 chapters and supplemented them with texts. The chapters of the publication convey titles such as "farewell," "cheerfulness," "lies," "rebellion" or "loneliness," with images capturing the contradictions of a dissolving state. In the mid-1980s, Hauswald photographed a dilapidated old building behind a furniture store's advertising hoarding; in front of a smashed windows and the run-down façade, the word "Wohnkultur" (home decor) are displayed. The images document the looming downfall of the GDR — from today's perspective, because at that time no one believed the Berlin Wall would ever come down, Hauswald told DW. "Intentional criticism of the state was not my inspiration," insists the 63-year-old photographer. "There was a niche society and this economy of shortage; I photographed what I saw. That was everyday life." He only later became aware how his images looked to others. Hauswald's Ostkreuz Agency, in collaboration with the Federal Foundation for the Study of Communist Dictatorship in East Germany, have together published "Totally East" as annotated poster sets for public institutions. Over 1,200 orders have already been placed from Germany, but also from countries such as Australia, Spain and Belgium. The material is also available in English, Russian, French and Spanish for German cultural work abroad and is supplemented by short interviews with Harald Hauswald on YouTube, in which he comments on the creation of individual photos. Curator Stefan Wolle chose from 2,600 photos. And the historian emphasizes that Hauswald had hardly any influence. "The photos are a liberation of humanity," says Wolle. "People are revealed who otherwise had no voice." These were people who were marginalized by a state that only presented outward images of strength. "It touched me to get another look at my own pictures through another perspective, to see them with a different emotional worldview and to discover a warmth in them that I had not noticed myself," said Hauswald. Hauswald's photos show sensitive, quiet moments, but also intimacy. The image of an old woman leaning on her walking stick on the street is an example of the dreariness of many works — and not just because all the selected images are black-and-white shots. The theme "longing" includes a shot of a children's carousel in Dresden, with the word "Südseetraum" ("south sea dream") at the top of the ride. It's a tragicomic provocation that hints at the discrepancy between state propaganda and real popular opinion. As the first GDR photographer to be published in West German magazines such as Stern and Geo, Hausewald's work of course could not remain hidden from the regime. "More than a dozen times I sat in the car for interrogation," remembers Hauswald. There were also house searches. He never knew if he would actually be arrested. He is now considered a photographer of the opposition. The Stasi had collected over 1,500 pages on him, noting for instance the details of how he'd go buy milk at the store and trying to demonstrate he was spreading subversive propaganda against the state. 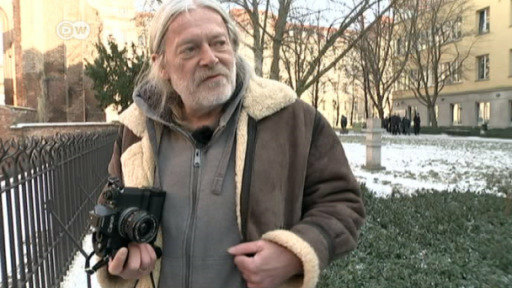 The photographer, who still uses an analog camera, has since been awarded the Order of Merit of the Federal Republic of Germany. How does he hope people will react to the exhibition? He noticed during a previous show during a photo festival that people no longer strictly associate his pictures to East Germany but rather see them as photos of everyday life. "That's great," said Hauswald. The exhibition "Voll der Osten. Leben in der DDR" (Totally East: Life in East Germany) is on show at the Berlin Podewil until March 1. The photo exhibit "Voll der Osten," or "The real East" celebrates the work of photographer Harald Hauswald. His black-and-white photos show the loneliness and sense of community, and the order and rebellion of a place that no longer exists, the GDR.